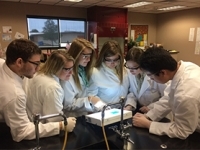 Project Lead The Way (PLTW) Biomedical Sciences Program is a sequence of six courses, which follows the PLTW Program’s proven hands-on, real-world problem-solving approach to learning. This S.T.E.M. (Science, Technology, Engineering, Mathematics) based program allows students to explore the concepts of human medicine and are introduced to bioinformatics; including mapping and analyzing DNA. 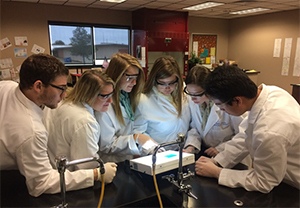 Through activities like dissecting a heart, students examine the processes, structures and interactions of the human body – often playing the role of biomedical professionals to solve mysteries: think CSI meets ER. They also explore the prevention, diagnosis and treatment of disease by working collaboratively to investigate and design innovative solutions for the health challenges of the 21st century, such as fighting cancer with nanotechnology. 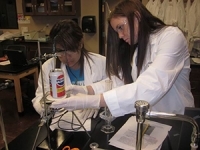 Their capstone course includes designing and testing a research project. 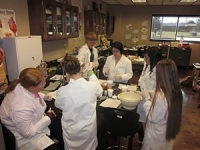 The Biomedical Academy helps take critical thinking skills and learning to a college level.